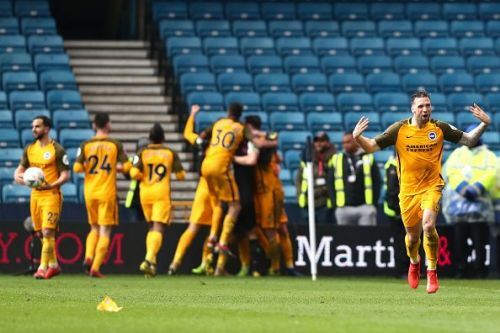 Brighton Hove & Albion went through to the FA Cup semifinals, joining Wolves, Manchester City and Watford, who booked their tickets to Wembley earlier this weekend. Chris Hughton's side went through after defeating Millwall 5-4 on penalties, after the game finished 2-2 in extra time. The match started off as a grimy grudge match, with the two sides playing a conservative, risk-free style of football. Early on in the second half, the two sides exchanged attacks, with both coming close to an opening goal. Millwall took the lead in the 70th minute with Republic of Ireland international Alex Pearce scoring from a corner kick. Minutes later, they doubled their lead, with Jed Wallace advancing past Brighton's left flank before slotting in Aiden O'Brien for a tap-in to seal a two-goal advantage. However, just when it seemed Millwall was set to advance to the semifinals, Brighton mounted a late comeback. Solly March dribbled past his man on the right flank and facilitated a low cross in for ex-PSV man Jürgen Locadia, who boxed out his man, controlled it, spun around, and launched a thunderous half-volley whilst outmuscling his man. Then, in the final minute of extra time, Millwall were penalized for a free kick outside the box. It was a long free kick, one that would likely result in a cross into the box for a team-mate, rather than a shot. However, March floated a long, seemingly harmless kick into the box, and goalkeeper David Martin lost track of the ball, with the ball slipping in past his fingertips and into the goal in the 95th minute. It was a horrendous error, but one that sealed Brighton's comeback. Shane Ferguson was soon sent off for Millwall late on in extra time, and after Jake Cooper launched his penalty kick over the bar, their fate was sealed. Brighton will face one of Watford, Manchester City, and Wolves in the semifinals.